The Macchiato or Caffè macchiato is a simple, often overlooked coffee that takes its name from the Italian for "stained" or "spotted" meaning the literal translation of caffè macchiato is "stained coffee" or coffee with a spot of milk. It's typically a single espresso served with a dollop of steamed or foamed milk (usually depending on the barista preference), the ratio of espresso to milk is greater than any other speciality coffee drink. With the addition of a small amount of milk, the espresso flavours are not overpowered by the milk for a softer experience than simply drinking espresso alone. Used by many as an alternative to adding sugar to espresso – or Cuban espresso – it is seen as a purist's drink but remains popular on the European continent. 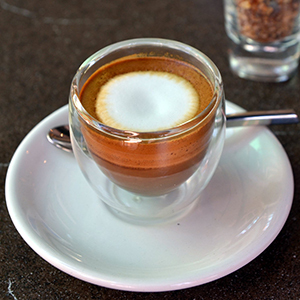 A great option for taking the 'bite' out of standard espresso, the macchiato is a key menu option for the purist coffee shop.